Make sure the computer you are going to install your Truly Ergonomic Keyboard is turned OFF (was "Shut Down" and not "Log Off", "Sleep", "Hibernate", nor "Restart"). Do not plug in your Truly Ergonomic Keyboard yet. For Model 207 using US layout: you can set DIP switch #4 to OFF to have an additional ↹ Tab key in the top-left corner instead of the ´ ¨ key. For Model 209 using JIS layout: set DIP switch #1 and #4 to OFF. For Mac OS X: set DIP switch #2 to the OFF position. After 1-2 minutes a message is displayed mentioning that your Truly Ergonomic Keyboard is installed and ready to use. You can review or download the Installation & Quick Start Guide in PDF format. 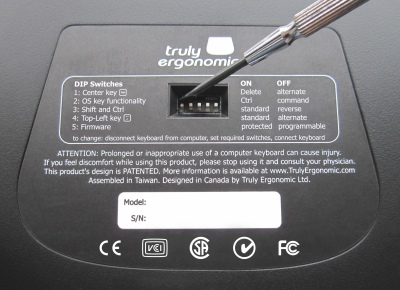 The Truly Ergonomic Keyboard requires no installation program and no special driver. It uses the Operating System standard keyboard driver already installed in your computer. preferably, when you are not nearing a deadline. compared to a lifetime of healthy typing. Your hands-wrists-shoulders will feel great, your typing speed will be the same as before or better, and you will be able to accelerate your productivity in a comfortable and healthy manner. During the first hour of typing, we recommend you look at the keyboard while typing and type "s l o w l y", even if you are a fast touch-typist. This will greatly help you get accustomed to the new keys' positions. this first hour of typing slowly will allow you to adjust faster. Some keys like the ↵ Enter, ⌫ Backspace, and Shift keys are located in different positions compared to other keyboards. These key's locations are better for your posture which benefits your health. Press the ↵ Enter key with either of your thumbs, press the ⌫ Backspace with either of your index fingers. We ask for your patience, particularly with the Shift and Ctrl keys, as typing in the initial days could be slower than before. As you use your Truly Ergonomic Keyboard, you will get accustomed to the new key's locations and your body will adjust to a healthier typing experience in a short time. With the revolutionary Truly Ergonomic Keyboard, you no longer need to bend your hands or wrists outwards while typing; you should type with your wrists as straight as possible, keeping your elbows close to your body, and without the need for your hands to match the exact split-angle of the Truly Ergonomic Keyboard. You do not need to align your straight wrists with the Truly Ergonomic Keyboard's columnar- alignment. Feel free to have your hands and forearms in the angle you feel most comfortable, as long as your wrists are as straight as possible. As well, only rest your hands on the included Palmrest when you are not typing. It is better to "float" your hands while typing, like playing the piano. Mechanical keyswitches require very low force to activate and provide a gentle tactile feedback when pressed that helps you feel when each key registers. If you hear a loud sound for each keypress, it means you are using too much force; press the keys as lightly as possible. 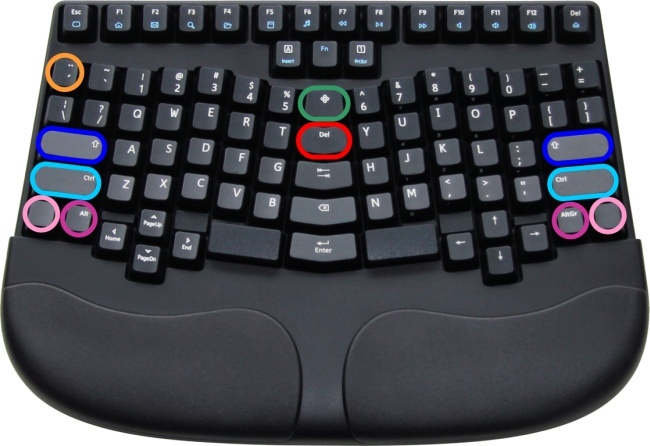 The Truly Ergonomic Keyboard is properly designed and therefore different from other keyboards. Some keys like the ↵ Enter, ⌫ Backspace, and Shift keys are located in different positions compared to other keyboards. These key's locations are better for your posture which benefits your health. After testing various options for the location of the Shift and Ctrl keys, we concluded that having the Shift keys on the home row, in our Truly Ergonomic Keyboard design, is the most ergonomic position, and is surprisingly comfortable. You no longer need to bend your wrist to press the Shift key, as in conventional keyboards. Once you become accustomed to these keys' locations, you will find it is a great improvement. Using the Mac OS X®, after setting-up your Model 209, the ❖ SuperKey becomes a command ⌘ key. Pressing Fn 5% is equivalent as Windows key Pause which in turn opens "Windows System Properties". Pressing Fn 6^ is equivalent as Ctrl Break. Additionally, if you change DIP switch #3 to OFF, the left spacebar becomes the Application/Menu key. The Truly Ergonomic Keyboard's ❖ SuperKey acts as the Windows key, pressing this key along other keys evoke Windows® shortcuts. The ❖ SuperKey is represented by a quad diamond shape and is located in the top-center of the layout. Not labeled are Fn 5% as the Windows key Pause, Fn ❖ SuperKey as the Scroll Lock, and Fn 6^ as the Ctrl Break. Both Ctrl keys on the keyboard become command ⌘ keys. The ❖ SuperKey becomes an additional command ⌘ key. Model 207: The left Alt key becomes an option key. The right AltGr key becomes a control key. Model 209: Both Alt keys become option keys. Both blank lower corner keys become control keys. Set DIP switch #4 to OFF in Model 207 to have an additional ↹ Tab key in the top-left corner instead of the ´ ¨ key. Set DIP switch #1 and #4 to OFF in Model 209 to use the JIS layout. ON Europe-2 (07.64:0x56). Extra 105th key found on standard keyboards with 105 keys (ISO). OFF Additional ↹ Tab key for US layout. The standard US layout (ANSI) only requires 104 keys, it doesn't use this 105th key; this option provides a secondary ↹ Tab key. OFF International-3 (07.89:0x7D) for JIS layout. ON Firmware Protected; does not allow reprogramming the firmware. OFF Programmable; allows firmware to be reprogrammed. All keys are fully programmable. 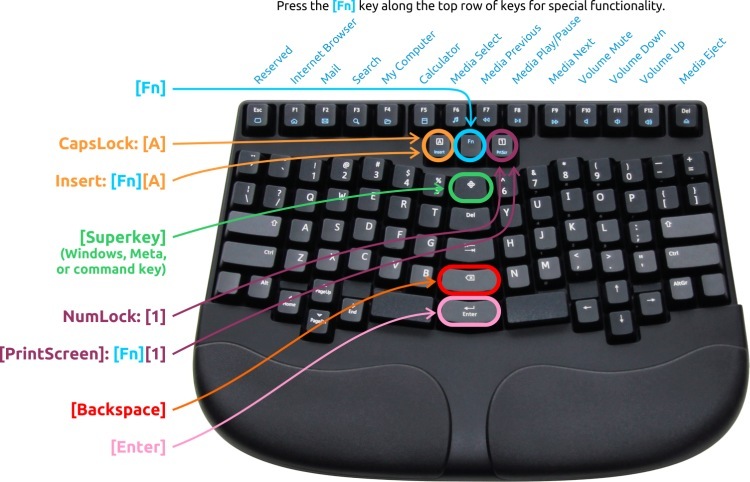 You can change the logical position of any key, add as many logical keys as you want, add special functionality to any key, have unique key configurations, and have up to six different layouts at once. Custom keys and layouts are saved internally so you can connect your Truly Ergonomic Keyboard to any computer without the need to install any additional software or to reprogram each time.